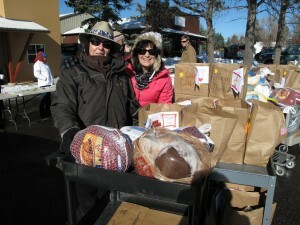 On Saturday, November 21, Tri-Lakes Cares’ Staff and Volunteers distributed holiday groceries to 149 local families in need. 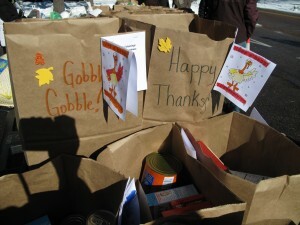 Each bag included the Thanksgiving basics – stuffing, cranberry sauce, pumpkin pie mix, etc. 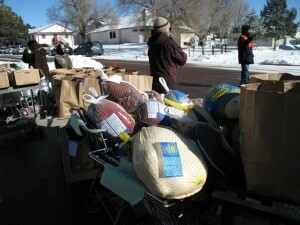 – and each family was able to choose between a turkey, ham or chicken to prepare for their holiday celebration. Although it was very cold that day, we all enjoyed ourselves. After all, isn’t Thanksgiving really about giving?! As often happens when participating in events like this, we at TLC began reflecting on what it is we are thankful for. Our answers were varied: football (the Broncos in particular), family, a reliable vehicle, healthy foods to eat at home, the opportunity to travel, our children, Serrano’s coffee, and more. And after we reflected on what it is we are thankful for, we took a minute to think about how many of the things we are thankful for, our clients go without. Our clients often cannot afford cable to watch the Broncos’ game or a reliable vehicle or healthy foods. Certainly travel is out of the question as well as the occasional splurge for a cup of coffee. We are so grateful for what we have, but we are also grateful for the opportunity to be a resource for our neighbors in need. Maybe we can’t pay for every cup of Serrano’s coffee or buy each of our clients a new car, but we can alleviate the financial burden experienced during an unforeseen medical emergency, the loss of a job, or even the reality of living in chronic poverty. So what about you? What are you thankful for this year?